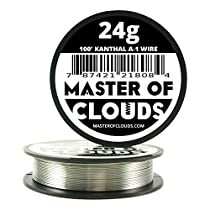 Kanthal A-1 is a ferritic iron-chromium-aluminium alloy (FeCrAl alloy) rated for use at temperatures up to 1400°C (2550°F). The alloy has high resistivity and great oxidation resistance. Great on 24 gauge for clapton coil. I use the 32g kanthal wire to make coils for my husband's mini fogger. I have no issues with this wire and it makes perfect coils every time. This is exactly what I needed! Better than the rest I've used. I find this wire lasts longer than others I've tried. Assuming other brands, because I got coils already made, and I don't actually know, but I do know the coils I've made with this have worked more consistently and longer than the other pre-made coils. Considering what shops want for what is literally a few inches of wire, this should last quite a while for a mere fraction of the price. Added bonus: I can re-string my egg slicer and my cheese board.